I love hearing from people that have a positive outlook on things, don’t you? While we could all whine and grumble (and it’s okay to do that once in a while), it’s much more interesting for me to see someone that inspires people to look for the good in life. And make no mistake, there is so much good in life! To that end, I fell in love with Sherry Belul‘s site, Simply Celebrate. I found it inspiring and hope you visit. In the meantime, let’s learn a little more about Sherry. I’m completely intrigued by your site, Simply Celebrate. What a wonderful approach to life. How did your website start and what kind of feedback have you received? My website initially started as a place to market my book, Simply Celebrate: 101 Ways to Turn Ordinary Days into an Extraordinary Life . However, it quickly became apparent to me that there was a whole world of celebration that wanted to emerge online. I’ve been fortunate to have had so many amazing teachers in my life — writers, artists, Zen teachers, coaches, etc — and I began to see that the website could become a place to share all of these amazing resources. So many people (including YOU Cherie!) are doing work in the world that helps people find more joy, color, and connection in their days. 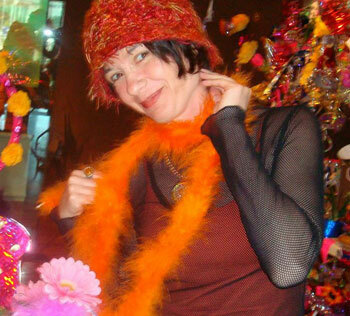 I want Simply Celebrate to become a one-stop-shop where folks can find a myriad of ways to celebrate their lives and to consciously create an extraordinary journey for themselves. Tell us about the Virtual Happy Hour you have every Monday. 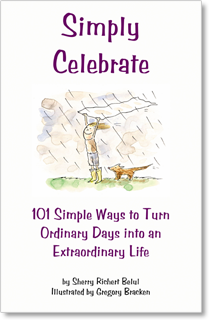 How did you come up with the concept for your book, Simply Celebrate: 101 Simple Ways to Turn Ordinary Days into an Extraordinary Life? I didn’t really come up with the concept for the book. It kinda just found me. I have a history of anxiety and depression in my life. And at some point was fortunate to be introduced to Cheri Huber, an amazing Zen teacher. Out of my Zen practice grew a deep understanding of what it is to pay attention and how a whole world can happen in just a single breath. I suddenly saw that my depression was not a solid iron prison, like it had always felt. I could breathe in deeply and have a momentary sense of relief and expansiveness. Joy even. From there, life just seemed to show me the way: that I could consciously direct my attention to moments of joy. In fact, I could consciously CREATE moments of joy. Somehow, once I became aware of these subtle ways of being in the world, everything started to change for me. I started seeking out simple ways to create extraordinary moments. Life began to feel new and magical. I started keeping a journal of celebration ideas and then life dropped in the idea that my artist friend, Greg Bracken, could illustrate the ideas and I could publish a book. Let’s move on to a favorite subject here at Working Writers: books! What’s the most interesting book you’ve ever read? Wow! Great question. I think I’d have to say the most interesting book for me was Cheri Huber’s The Key: And the Name of the Key Is Willingness . As I mentioned above, I was given a copy of this book many years ago and it gave me an entirely new framework for looking at my life. It taught me that I am not the voices in my head. It taught me the practice of developing awareness, compassion, and joy in my life. This tiny, hand written book, truly was a key for me. It unlocked so many doors within myself — most definitely leading me to who I am today. I guess it was pretty interesting to me!!! I am reading a beautiful novel by Kent Meyers called The River Warren What I love so much about this book is that the story is told from many different view points. Each of the narrator’s has a very unique voice and gives a different slant on the story. It is a very very human book — meaning there is a lot of poetry in the telling of the story and there are many levels of emotion, which get revealed as the story is told. I highly recommend this book. I am incredibly fortunate that I’ve had a writing job in which I get to review hotels for families. One of my absolute favorite ways to spend a Sunday afternoon is when I go on an adventure with my ten-year-old son to a hotel in San Francisco, where we live. Kayne, my son, and I both pack up at least two books and our favorite snacks, and we settle into the magnificently clean hotel room to spend the afternoon reading together. I LOVE this. When I am at home I often feel pulled in a hundred directions — clean the house, get some work done, write letters, work on projects — but at the hotels, all that is there is me and my son and our books. Ahhhhhh! Please come visit www.SimplyCelebrate.net. Sign up for my free newsletter or my blog, Cherry Blossom Soup! Folks can also connect with me on the Simply Celebrate Facebook fan page. (www.facebook.com/simplycelebrate). Also, check out the one-of-a-kind Celebration Books I create at www.MadMoon.com. 2 Comments on "Interview: Sherry Belul"
I loved this interview and learned more about the truly extraordinary Sherry Richert Belul. I have been a fan of her work for some time! She is a bright shining example of positivity and authenticity! Thanks for commenting, Jeanette!~ I agree, Sherry is pretty amazing. I really like meeting people that help lift you up.